This fully managed switch is the expert for the intelligent networking of small offices and business premises, and for sub-distribution of branch-office infrastructures. It has a fanless design and is equipped with eight Gigabit Ethernet ports and two combo ports (Ethernet or fiber-optic). It is ideal wherever full management but no PoE is required. Orchestrated from the LANCOM Management Cloud, it is configured efficiently and automatically by SD-LAN. 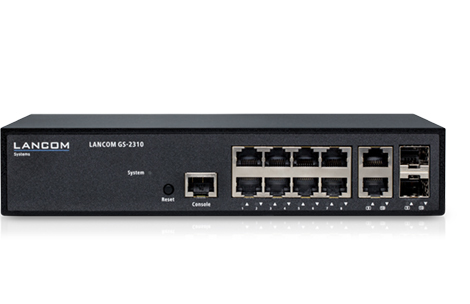 The LANCOM GS-2310 is equipped with 8 Gigabit Ethernet ports and 2 combo ports (Ethernet or fiber-optic). With a data throughput of 20 Gbps on the backplane, it offers full performance even under load. This switch is a high-performance basis for modern network infrastructures at small and home offices. The LANCOM Management Cloud opens the way to the most advanced switch management: Software-defined LAN (SD-LAN). SD-LAN orchestrates the port profiles for each switch and automatically assigns the necessary network configuration, e.g. the required VLANs. At the click of a mouse, switch configurations that are fully customized to each site's network architecture are simultaneously rolled-out or updated. 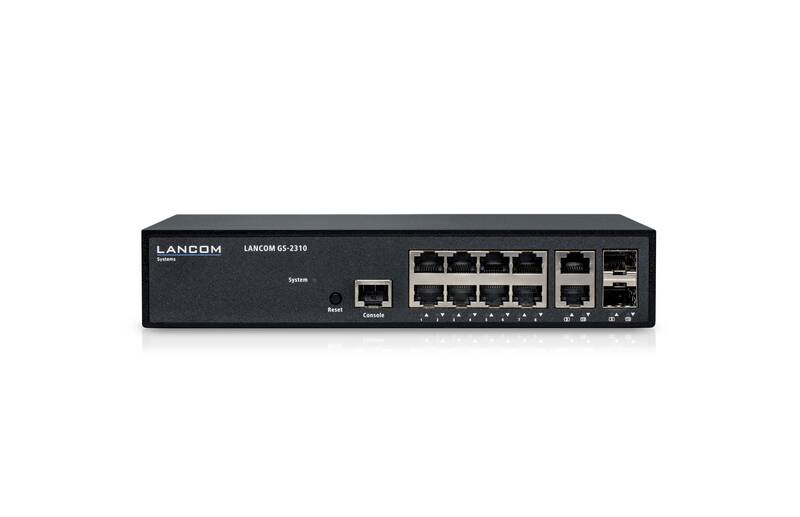 The LANCOM GS-2310 stops rogue clients from gaining unauthorized access to the network. This is ensured by secured access control on all ports based on IEEE 802.1X (port-based, single, multi, and MAC-based). Secure communication protocols such as SSH, SSL and SNMPv3 mean that the LANCOM GS-2310 is ideal for the professional remote management of networks. The switch also supports the TACACS+ protocol for authentication, authorization, and accounting. This optimized solution promises maximum security for multi-site network management and monitoring. Thanks to the dual-stack implementation, the LANCOM GS-2310 operates in pure IPv4, pure IPv6, or in mixed networks. This means that it can be managed via both IP address standards, which makes it fully future-proof. Every day, our customers rely on products to the highest standards of quality. These quality standards also include fast help, just in case things should go wrong. This is why the LANCOM GS-2310 comes with a standard warranty of 5 years. Optimally alligned, the LANCOM switch portfolio is suitable and applicable for complex, distributed networking scenarios. Thanks to SD-LAN over the Management Cloud, formerly manual device configuration is replaced by automated network orchestration. Each and every switch and access point at the various sites operates with a fine-tuned configuration. SD-LAN orchestrates the port profiles for each switch and automatically assigns the necessary VLANs to the desired switch ports. Configurations can can be synchronized across locations with regard to the network architecture and rolled-out or updated simultaneously at the click of a mouse.